In recent years, the water level of Hau (Bassac) River has changed and higher floods have been occurring. Many parts of Ninh Kieu district of Can Tho city are flooded annually. In 5 years from 2010-2015, flooding has occurred more frequently in many areas of the district. At the same time, there has been a significant change of land use pattern in peri-urban areas such as An Khanh ward and An Hoa ward. Unplanned urbanization in many areas worsened the tidal flood situation. In these areas, there was no investment in infrastructure because of the phasing of plan implementation, while concrete surfaces have increased sharply due to autonomous local construction. Also, a systematic drainage system has not been built. As a result, these neighbourhoods are often inundated with floods. 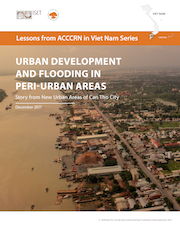 This research determines the causes of flooding the developing peri-urban areas of Can Tho, with a focus on the relationship between urbanization, climate change and urban flooding.